Whether a Small Dinner Party or a Large Wedding Reception, we offer you a friendly and helpful service - at affordable prices. Delivery / Collection on request. Washing up service if required. 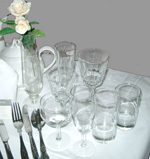 Etiquette Catering Equipment Hire for Sudbury, Suffolk. Bury St Edmunds and surrounding areas.